Though it's better known for its many styles of fantasy and replica weapons, United Cutlery also designs knives in a tactical style. 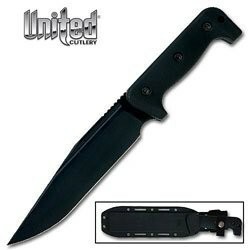 Imported from China, the practical offerings from United Cutlery include the M48 Kommando Fighter Knife. With the makers and most of the technical specifications somewhere on the other side of the world, we're left with a few doubts about this knife. United Cutlery provides very little detailed information beyond identifying the steel as 440. Assuming that's the low grade of 440A doesn't eliminate the possibility that a good knife could be found here for a bargain price. With a massive Bowie-style full tang blade 7-3/4 inches long, an overall length of 13-1/4 inches and a fighter style grip of black Kraton with dropped bolsters, the price per ounce is attractive. A black tactical coating does give the knife a professional look, but the bolted Kraton slabs laid over the full tang handle don't show the perfect fit you should find in a professional knife. Fastenings are minimal and probably will need some adjustment occasionally. There's a respectable amount of steel in this large blade, but also some uncertainty about quality control. More clues come from United Cutlery's warranty and exchange service, which isn't generous. If buyers do have issues with this knife, the only recourse will be customer service at the retail level. Made by a company more expert at producing knives and swords destined for the wall or costume, the M48 Kommando Fighter has to build a reputation as the real thing. Many other brands of knives in the same price range already have that.